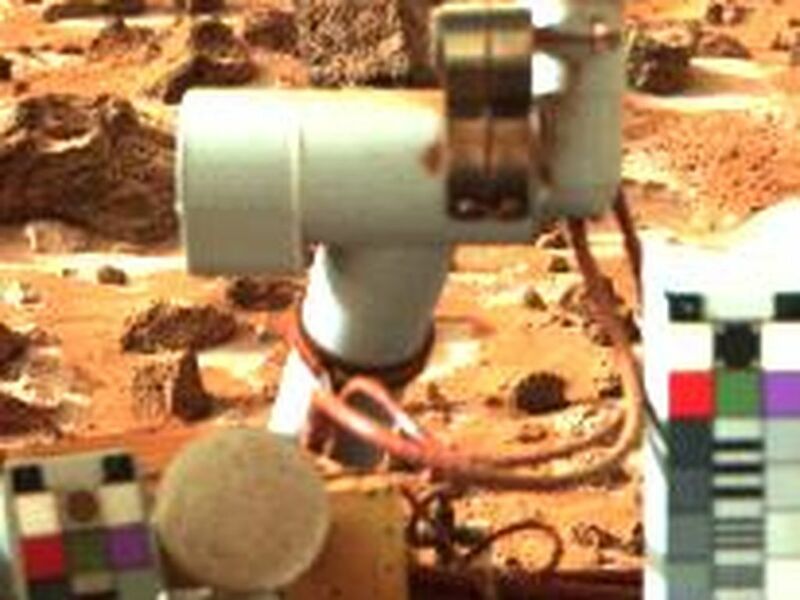 Photo from Viking Lander 2 shows late-winter frost on the ground on Mars around the lander. 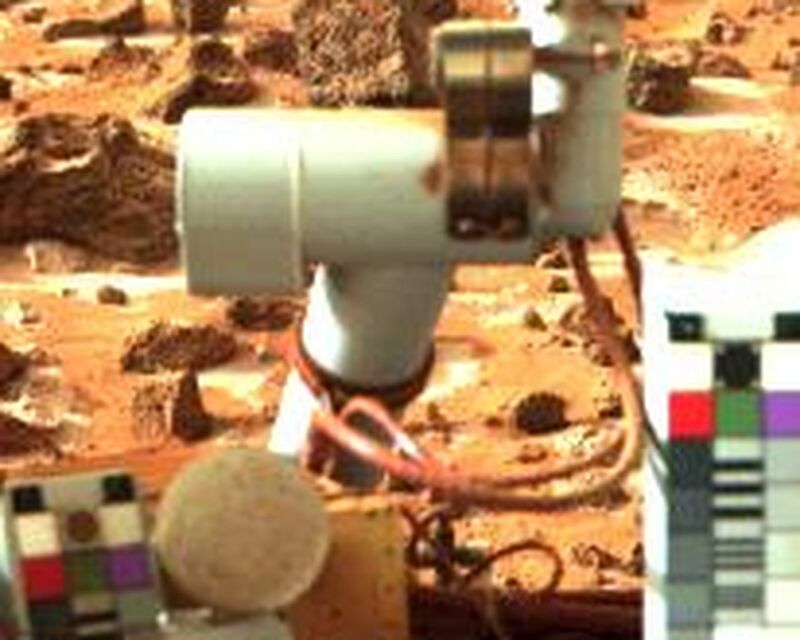 The view is southeast over the top of Lander 2, and shows patches of frost around dark rocks. The surface is reddish-brown; the dark rocks vary in size from 10 centimeters (four inches) to 76 centimeters (30 inches) in diameter. This picture was obtained Sept. 25, 1977. The frost deposits were detected for the first time 12 Martian days (sols) earlier in a black-and-white image. Color differences between the white frost and the reddish soil confirm that we are observing frost. The Lander Imaging Team is trying to determine if frost deposits routinely form due to cold night temperatures, then disappear during the warmer daytime. Preliminary analysis, however, indicates the frost was on the ground for some time and is disappearing over many days. That suggests to scientists that the frost is not frozen carbon dioxide (dry ice) but is more likely a carbon dioxide clathrate (six parts water to one part carbon dioxide). 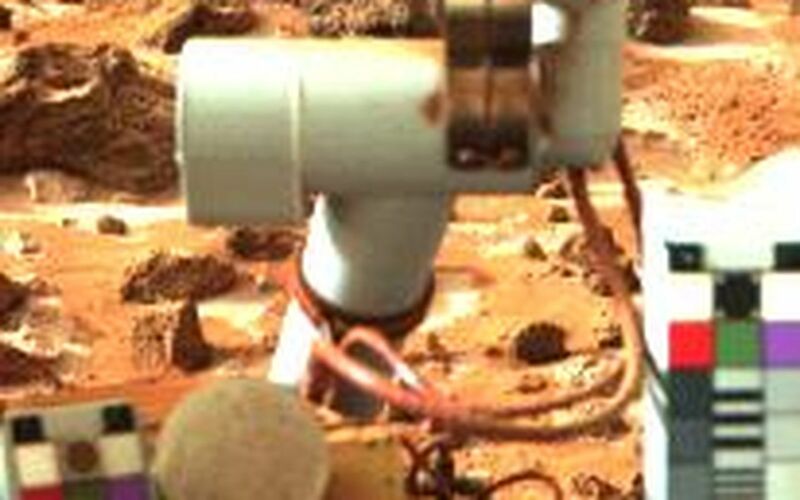 Detailed studies of the frost formation and disappearance, in conjunction with temperature measurements from the lander's meteorology experiment, should be able to confirm or deny that hypothesis, scientists say.